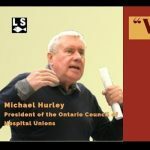 Michael Hurley, President of the Ontario Council of Hospital Unions, Calls on Workers to Resist Doug Ford. There are over 100 cities around the world with fare-free public transportation systems. The draft Congressional resolution calling for the development of a “Green New Deal” has sparked a massive global reaction. On the Prairies, five dollars is the annual payment “status-Indians” receive in exchange for the Crown taking up lands and accessing resources. We released a report documenting what has happened to Airbnb’s business in Toronto since the appeal. Ecosocialism is a green political philosophy – an ecocentric and democratic socialism, not to be confused with social democracy. A view from the streets of Winnipeg. De Zeyas answers questions about the current situation in which several countries are no longer recognizing president Nicolas Maduro as leader. Ottawa recently recognized the leader of Venezuela’s National Assembly as that country’s president because Maduro suspended the constitution and lost legitimacy.